Planetary-cone drive : This is basically a planetary gear system but with cones in place of gears. The planet cones are rotated by the sun cone which, in turn, is driven by the motor. The plan­et cones are pressed between an outer nonrotating ring and the planet hold. Axial adjustment of the ring varies the rotational speed of the cones around their mutual axis. 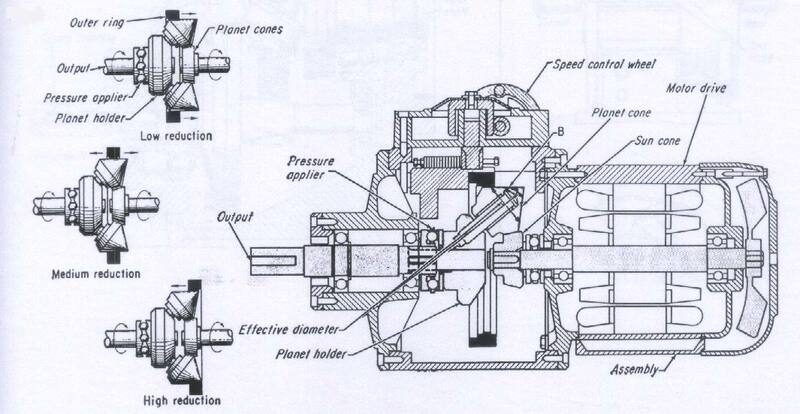 This varies the speed of the planet holder and the output shaft. Thus, the mechanism resembles that of the Graham drive. The speed adjustment range of the unit illustrated is from 4:1 to 24:1. The system is built in Japan in ratings up to 2hp.